Deheubarth was a southern Welsh kingdom, arising from the former kingdoms of Dyfed and Seisyllwg in 920 AD, under the rule of Hywel Dda. At various times, it fell under the auspices of Gwynedd, namely, during the rule of Gruffydd ap Llywelyn in 1055 AD. The Norman conquest, as for the Saxons to the east, was not a happy event, however, and Deheubarth fell to them before 1100 AD. 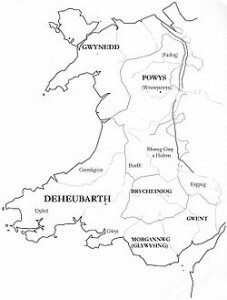 These Normans conquered the southern regions of Wales more fully than they ever did the north, including Deheubarth (until 1282, at which point Edward I conquered all of Wales). The Normans accepted a client rule in certain instances and granted Cantref Mawr to Gruffydd ap Rhys in 1116. In time, he passed its rule onto his son, Anarawd. With the help of Owain Gwynedd, Anarawd and Gruffydd successfully revolted against their Norman masters in 1136. Gruffydd was killed in battle in 1137 and Anarawd went on to rule Deheubarth until he was murdered by Owain Gwynedd’s brother, Cadwaladr, in 1143. This stand by Rhys ap Maredudd came in 1287, after the death of Llywelyn ap Gruffydd. Rhys had supported King Edward, despite overtures from Llywelyn. “But the actions of the royal officials of the shire irked him, and moreover he had a feud with the Giffards of Iscennen ( Llandovery ). His grievances, however, as T. F. Tout puts it, were ‘those of a Marcher rather than those of a Welshman .’ http://yba.llgc.org.uk/en/s1-RHYS-APM-1291.html He was eventually caught and executed in 1291. Nice article, but if you are going to make vids you really should learn a little better how to pronounce Welsh. “Deheubarth” is not pronounced “DE-hue-barth” but more like “de-HIGH-barth” for example. Thanks for the tip. I’m working on it.